Holiday Cheeseball Bites, just took the regular cheeseball to a whole new level. These Holiday Cheeseball Bites, have all the flavors in just one bite. They are so easy to make and taste amazing. These are by far, the best holiday appetizer. I love our grandma’s cheeseball during the holidays, but I don’t like that I can’t have some of the delicious peanuts or bacon bits in every bite. Once I found out there was a way to have everything I loved in my holiday cheeseball, I knew I had to give these a try. These Holiday Cheeseball Bites are the perfect appetizer for any of your holiday parties. They are sure to please even the pickiest cheeseball lovers. What could I use in place of walnuts? If you are not much of a walnut fan, don’t worry. You could easily substitute the walnuts out for something else. I personally prefer using almonds or pecans, when rolling my cheeseballs, but you could also roll it in shredded and shopped cheese, such as parmesan, mozzarella, or cheddar. I also like rolling mine in just bacon, and nothing else. They are also very delicious plain, without being rolled in anything extra. what could I dip in the cheeseball? The most critical part of this recipe, is deciding what types of food to dip in it. I personally wouldn’t mind going in with a spoon, but it may taste better with a little something crunchy. For this picture, we used a small pretzel, but you could easily switch it up, and add your favorite dipping cracker, or bread to it. We take you through each recipe, step by step, and show you exactly how to make it.Each recipe is tried and true, so you know you can trust that your family will love it. We understand how difficult it can be, to make a recipe you have never seen before, which is exactly why we created our channel. If you aren’t a fan of cheeseballs, and like dips a little better, you may like our Perfect Pineapple Dip. Combine cheese spread, cream cheese and butter in a bowl. Microwave for about 25 seconds to soften it. Mix together well. Add pimento, green pepper, onion, Worcestershire sauce and lemon juice and stir in by hand. Let it set up in the fridge for about 30 minutes, so that you can form it into a balls. Roll mixture into 1 inch balls, and roll half in bacon bits and the other half in walnuts. Place a pretzel stick in each ball and serve, or refrigerate until serving. We served ours with pretzel sticks, but love to eat them with crackers too! These are fun! 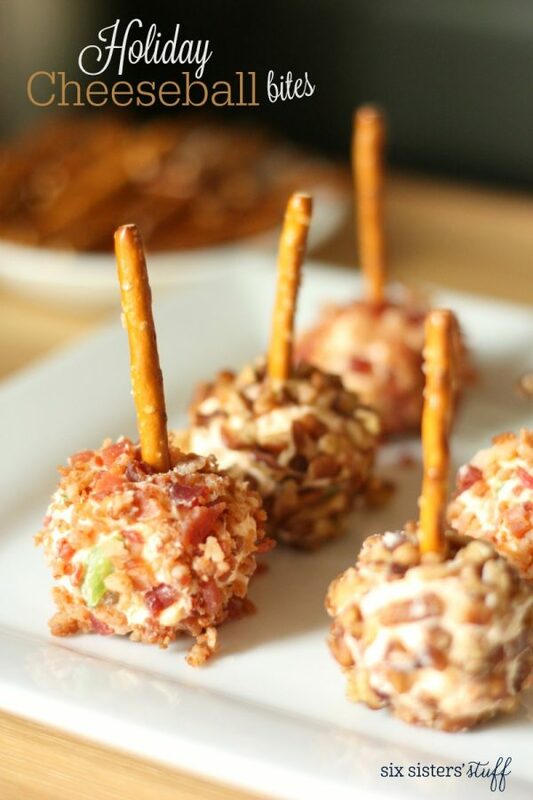 Cheeseballs are one of my favorite holiday foods, and I love that you get peanuts and bacon in every bite! Yum! By green pepper do you mean bell pepper? I can't wait to try these!! Yes, a green bell pepper. Cheeseball has been one of my favorite since I was 8. Now that I'm 32, I still love it! I'm planning to try this recipe our this weekend, thank you for sharing! Oh and one more thing, do you think this will still work without the lemon juice? It will be just fine without the lemon juice. Do you have any ideas or suggestions to make vegetarian by eliminating the bacon?